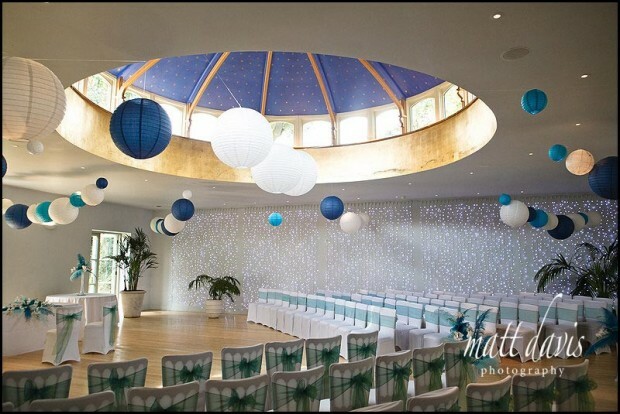 Matara is set in 28 acres of glorious Cotswold parkland in Kingscote Park, near Tetbury Gloucestershire. With a beautiful Regency house and the Matara Centre available for your wedding day, this is a wedding venue offering beauty and tranquility. Matara is very proud of its green credentials and offers all wedding couples the opportunity to plant their own tree. Matara offers a choice of locations for your civil wedding ceremony either the unique cloistered courtyard with ponds or the glass-doomed celebration room accommodating up to 150 people. 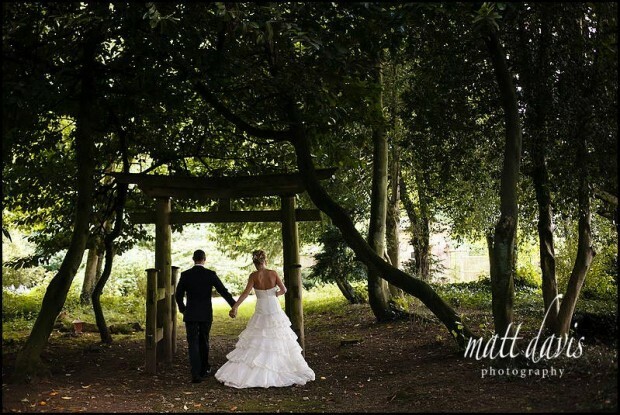 The beautiful gardens at Matara takes you through woodlands, parkland and walled gardens offering wonderful backdrops to your wedding photographs at Matara. Other wedding venues close by: Kingscote Barn, Chavenage House, Great Tythe Barn, The Rectory Hotel. 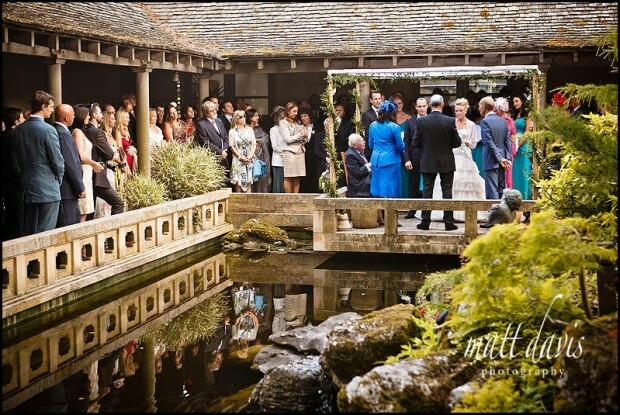 Nothing is similar to Matara….or not that I’ve come across in the Cotswolds that’s for sure! This is why it’s so unique as a wedding venue. It’s a hidden gem and that’s why you need to get married there. If you’re the kind of client that want’s all your family under one roof and close by then why not hire the super size 8 bedroom house (okay, maybe 4 or 5 rooms, I’m not exactly sure), but it’s a great way to make a weekend of it. Not only is this a unique wedding venue, they offer the quirky wedding day activities such as tree planting, tying things on a tree(! ), walking around a circle of stones – you name it, I’m sure they have it……. all wrapped up in that beautiful wood and mature gardens. You have the option of an outdoor ceremony or the use of the unusual wedding ceremony room. If you’re looking for the traditional approach to a wedding though, why not take a stroll down the road to Kingscote Church. Throughout Matara there are plenty of cosy seating areas too, or guests can enjoy reception canapés in the courtyard. One thing I will say is…….I always thought this venue looked, well, ‘kinda hippy’! Maybe it was their website, I don’t know, but definitely, definitely check it out…..it’s certainly a place your friends and family will remember from your wedding day. I’m pleased to be recommended by Matara as a wedding photographer. You may see examples of my work on their website too. You can also see some of the weddings I have photographed at Matara on my blog. I’ve photographed several weddings at Matara, please read the wedding testimonials from some of those clients.